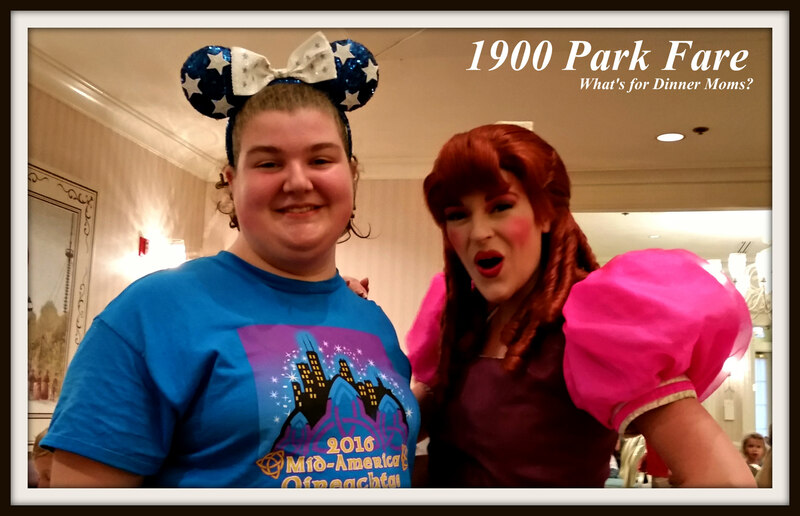 Cinderella’s Happily Ever After Dinner – 1900 Park Fare – What's for Dinner Moms? 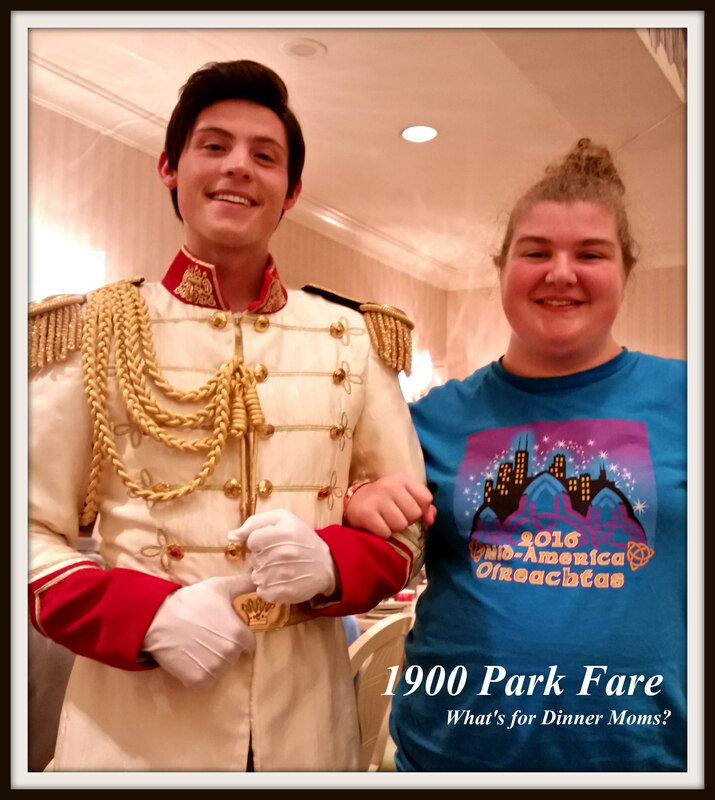 Cinderella’s Happily Ever After Dinner at 1900 Park Fare in the Grand Floridian offers a chance to meet with some of the characters from Cinderella that are harder to find in the parks. Cinderella and Prince Charming, Lady Tremaine (Cinderella’s step-mother), Anastasia and Drizella (Cinderella’s step-sisters) are normally in attendance. On this night Drizella was noticeably absent. Now, I like the Grand Floridian as a whole but tend to think their restaurants need updating. 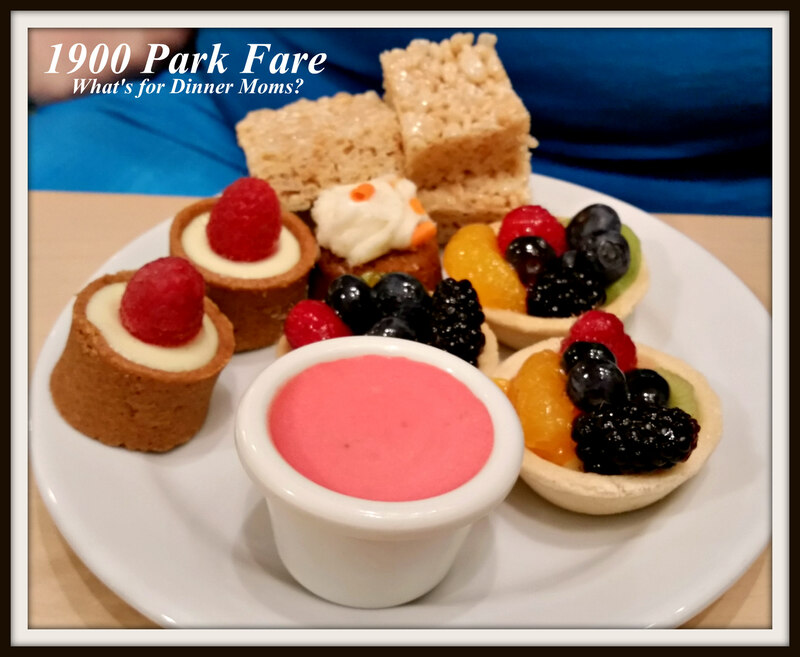 1900 Park Fare is windowless and has a strange, sickly yellow glow from the lighting. The decor looks like it came right out of a 1980s catalog. It is also fairly crowded. If you are along the banquette seating along the side you will know everything about the families around you. But, the decor, and lighting is not what draws people to this meal. It is the food and the characters. From the top of the plate going around clock-wise is butternut squash ravioli with cream sauce, Japanese style green beans, Mongolian beef stir fry, herbed au gratin potatoes, grapes, a roll and sliced turkey breast. Now, some people hate them but I love buffets. It gives me a chance to try things I normally may not try and if I don’t like it I don’t have to eat it. The butternut squash ravioli was one of the I don’t know if I will like this picks for me. I loved it! It was sweet and savory all at the same time. I had more of those on my second trip to the buffet. The green beans and Mongolian beef were both delicious but the star of the show on the plate was the herbed au gratin potatoes. They were super creamy, cheesy and had a great blend of spices. I even told my daughter I want to get the recipe for this dish. 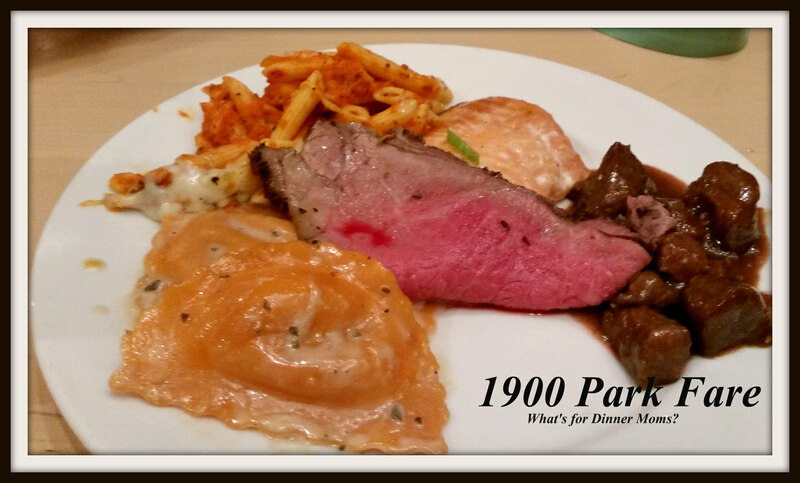 Again with why I love buffets is this is my daughter’s plate. 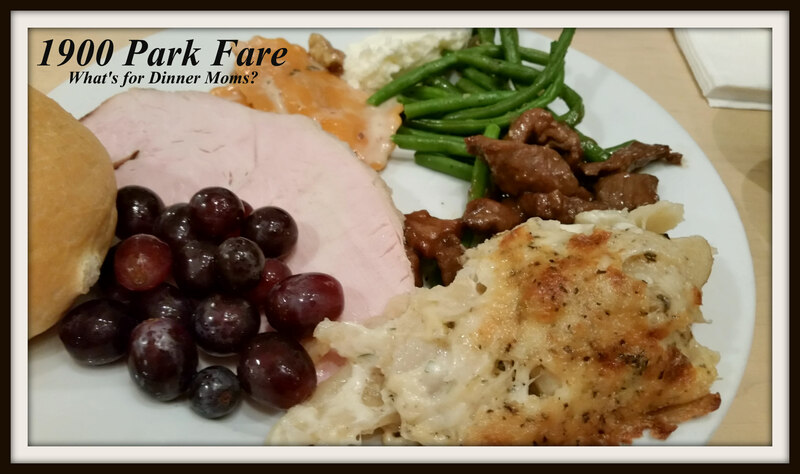 She had Italian pasta (from the kid’s bar), beef tenderloin, miso salmon in addition to the Mongolian beef and butternut squash ravioli. When she went back for seconds which I do not have pictures of she tried the macaroni and cheese off the kid’s bar because as she said it was not the usual bright orange (Stouffer like) macaroni and cheese that is served at most places in Disney World but rather as stated on the placard was home-style. The character interaction was really what this meal was about. Prince Charming was sweet but just off the mark for my daughter. She said, “Good thing he’s royalty because he would regularly get beat up in school.” Yes, that is our sense of humor. 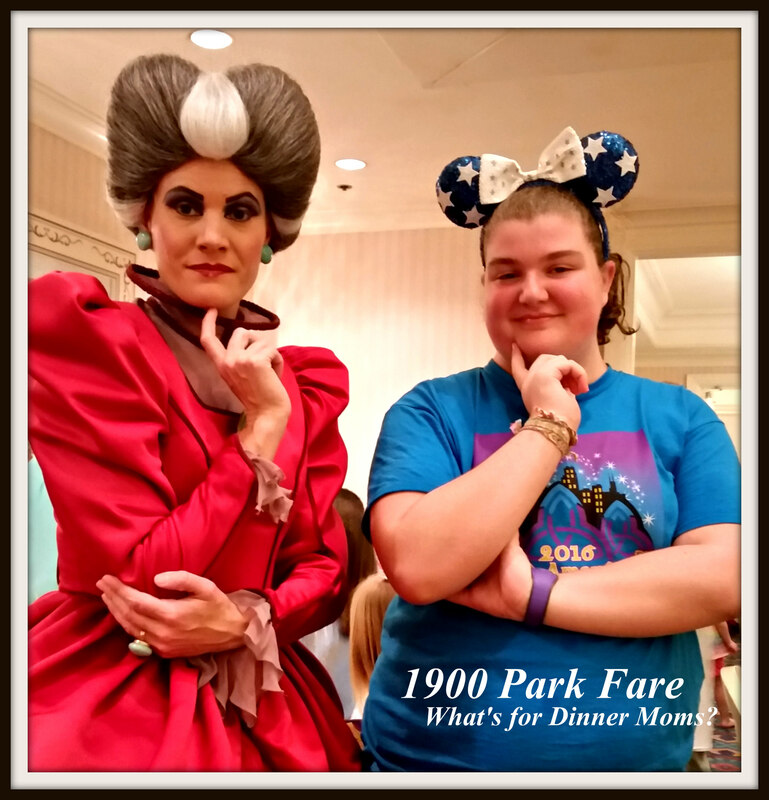 Lady Tremaine, above, was perfect. She had the glare down but still had enough warmth in her voice to not scare small children. She had my daughter dancing in the aisle once she explained what Oireachtas (Irish dance regional) meant. The character that stole the show was Drizella. You could hear her through the whole restaurant. I asked my daughter about the child who was screaming repeatedly and she told me it was Drizella yelling, “Cheeeez” in a high-pitched nasally voice every time someone took her picture. She was loud, funny, and made our evening. We have only one or two pictures where we are not laughing. Cinderella also came through the dining room but she was bland. There was nothing wrong with her but she just wasn’t as remarkable as Lady Tremaine and Drizella. After getting all the pictures and autographs from the characters we moved on to dessert! This was my daughter’s plate of desserts. She does not like chocolate things so she was very pleased at the choices offered. She dipped her rice crispy treat in the strawberry soup and thought that was the best dessert on the plate. She liked the fruit tarts but at the cream and fruit out of the cup. She thought the crust for the tarts tasted too manufactured. On the other hand I am all about the chocolate! The little dark chocolate cups with mousse were really rich and delicious. The cannoli were my favorite though. The cookie and brownie were okay but didn’t rate more than one bite. 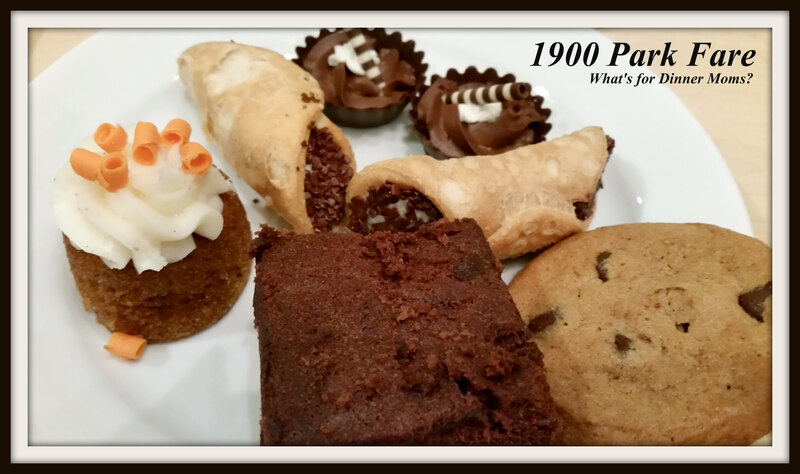 The carrot cake bite was good but I was all about the cannoli! Overall this was a fun meal with really good food. I would definitely go back just for the food. The character interactions were hit and miss to me but my daughter loved it so that is all that matters. We had a similar experience with our Cinderella last summer. Which her blandness was amplified by the quirky fun personality of Aurora who we had visited just before. Wonder if that’s just how Disney perceives Cinderella. Maybe, if you think about the story she really drives none of the action. It is all what happens to her. Interesting. Definitely, in the cartoon version for sure.